Oh upper level math, you will be the death of me….Well, not really, but sometimes it feels that way. I managed to scrape my way through algebra in high school, but honestly, geometry felt like trying to learn Chinese. I swear my friend and I passed because we were in a class full of trouble makers at the time and we kept our mouths shut and the teacher was grateful. So, this year, I was trying to figure out what to do with my 10th grade son for geometry. Thankfully, I was offered a chance to review VideoText Interactive, which provided the answer to my question. With Geometry:A Complete Course I was given online access to the course for a three year time period. The geometry course includes six modules with a total of 176 lessons. Once the course has been completed, students can claim credits for geometry, trigonometry, and pre-calculus. 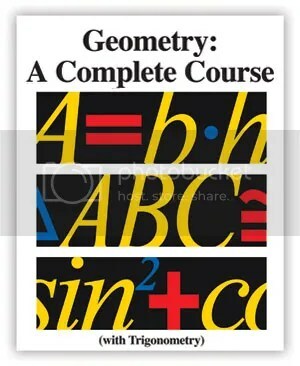 It is recommended that students complete the Geometry course after finishing VideoText Algebra. Depending on where your child is in their math sequence, this could be used for grades 9 and up. In general, lessons follow the same format. In some cases, there will be a quiz on the previous material before students can start the next lesson. In that case, the parent administers the quiz and then reviews it with the students. There are two versions of each quiz, so if my son did not perform well on the first quiz, he and I would review it together, and I would have him take quiz two before moving on. From there, students watch the video lesson. As the video plays, the objective for the lesson is displayed to the right of the screen, reminding students of the focus of the lesson. The lessons themselves were not long, and my son found them easy to watch. I usually watched the videos with him, mainly because if he had a question I needed to know what to do as well. Occasionally if I was busy, he could watch a video on his own, and then I could rewind and review it if he needed help, but I found it best to just watch them together. We also found it helpful to print out the course notes page prior to the lesson. This is a page that includes important information that your student can refer to when working on the problems. My son liked to use this page to take notes. After watching the lesson, students complete the worktext page, which is basically practice problems. You can choose to print these out if you want, but in the interest of saving ink, my son completed the work in a notebook. The worktext is simply a textbook PDF and some of the assignments were lengthy, so I usually had my son complete the odd or even problems. One of the things I really LOVE about VideoText is the complete solutions manual. You get all the answers to every problem, which makes it easy to figure out mistakes. I found this VERY helpful. Now, as the parent, you receive a separate login from your kids. As the parent, you have access to complete PDF’s of all of the course notes, solutions manuals, tests, and answer keys. You also have full access to all of the same lessons your child does. I found this convenient because if there was something I wanted to print out I could find it easily. The only drawback I really found to this program is the fact that there is no automatic grading. You have to record your own grades. It would be great if there were a scoring option, but other than that, I think this is a really solid program. My son didn’t “hate” it (and he loathes math, so that says a lot). It was easy to accomplish in the sense that the program is well set up and easy to use. You just log in and complete each days lesson in order, so it takes very little prep on the part of the parent. The instruction is very clear and precise, and the length of the videos make them easy to watch. The cost, however, could be prohibitive for many families. At $299, VideoText Interactive is not cheap. Honestly, if it weren’t for the fact that I got this as a review, it would definitely NOT have been in our budget for this year. However, that cost does include pricing for two students for three years worth of material, so when you think about it that way, it really isn’t bad. At any rate, I would say that it is worth a look. Posted on October 1, 2013 by brandymelissa	• This entry was posted in math, review and tagged curriculum reviews, Math. Bookmark the permalink.